The World Trade Organisation: Success or failure? 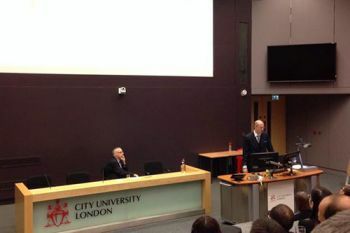 In his inaugural public lecture on 3rd June, The City Law School’s Professor David Collins assessed the achievements and deficiencies of the global trading body during its first 20 years. Professor of International Economic Law, Professor David Collins, delivered his inaugural public lecture on 3rd June in the Oliver Thompson Lecture Theatre. Titled ‘20 years of the World Trade Organisation’, the lecture looked at the achievements and deficiencies of the global trade body since it came into being in 1995. Professor Collins gave an outline of the history and key principles on which the organisation was founded. These are tariff reduction, the prohibition of quantitative restrictions, transparency, harmonisation and non-discrimination. While the WTO has undoubtedly increased global trade, its contribution to globalization has harmed a number of sectors, particularly manufacturing in the West. He critically examined the dispute resolution mechanisms within the WTO, widely regarded as one of its greatest achievements. Suggesting reform measures to the WTO court, Professor Collins called for better access by developing countries; greater compliance with decisions; more transparency of the dispute resolution process and better case-load management. Professor Collins, the author of The World Trade Organisation: A Beginner’s Guide suggested that over the next 20 years, barriers to trade will increasingly come from private corporate actors as distinct from nation states. He said that the previous emphasis on the protection of producers from competition would shift towards one that protects consumers from risk. The event was well attended by students, staff, visiting academics and members of the legal profession.